These one cent single cigarette machines are the hardest to find of all the cigarette dispensers. 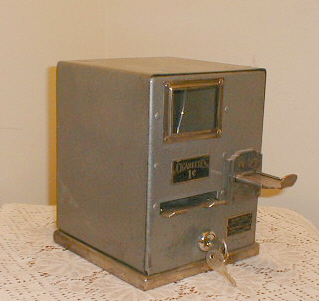 This 'Silver Comet' machine was manufactured by the REDCO Products Company in La Crosse, WI, 'with the approval of the IRS'. Metal body appears to have the original finish, showing moderate wear but still very presentable. Retains original 1 cent metal tag and production tag. Good working condition. The only visible damage is a hairline crack in the flat front glass window. Has a new lock with keys. Ready for your use. At 1 cent per cigarette, this would make a great money loser in today's market!